Making music using samples is getting easier, but one of the things that slows up the process and also the various pieces of software and hardware, is the size and type of the samples used. The size of the sample file effects its speed at loading and may take up valuable storage space. Stereo samples are also much larger than mono samples but often have effects applied which is why you would use them as stereo files. Also some platforms i.e. the Windows PC platforms or ported windows software will sometimes only work with WAV files, and these are also the files they Mac users often share with PC based musicians when collaborating. In reality is a quagmire which musicians can slide into with creativity dissappearing in the process. This is has been a nuisance to me personally in my development of a range of low cost Garageband tools, so i decided not to keep using large programs to open and review file details and to creat my own. 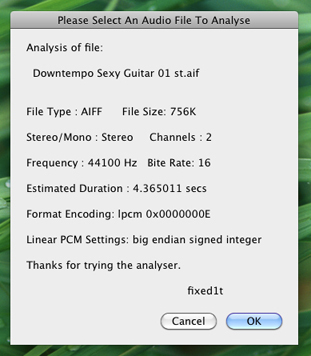 I have created this audio file analyser program enabling users to analyse Mac audio, sample and loop files and see the results instantly.